I love yoga books, and I’m often disappointed by them – not because they don’t have great information, but because too often they’re just a collection of postures or sequences with very little information about actual Yoga. My favourite books are those that deepen one’s understanding of yoga, as a state of presence, as well deepen our understanding of postures – which are simply a tool of yoga. Modern Yoga by Duncan Peak does both of these things. And even better, it does so in a gorgeous style. This has to be one of the best-looking yoga books I’ve ever picked up – the art direction is sublime. Yes, it’s independently published, and eagle eyes might spot the very occasional typo, but Modern Yoga presents the postures in a dynamic, colourful and intelligent manner that invites ones attention to linger on the page. The path of self-inquiry begins for most with the universal questions ‘who am I’.? Train your body so it is supple. strong, healthy and full of life-force to support you through the arduous process of understanding your mind and what causes its suffering. That in a nut-shell is the premise of Modern Yoga. Yes, it’s about a strong physical practice – but that strong physical practice provides the necessary foundation for working directly with suffering and self-inquiry. This foundation is further broken down into four main areas – Understanding Belief Systems, The Physical Practice, Nutrition and Meditation. 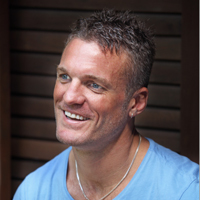 While the physical practice is predominantly a strong Vinyasa Flow practice, Duncan is also a passionate advocate of Yin Yoga as balance for that Yang practice, and dedicates some of the book to exploring Yin. What really sold this book to me was the focus on belief systems – this is how Power Living is making yoga accessible to a modern audience. They don’t, as I feared, strip out all the psychological work that is the essence of yoga, but find a modern way to explain it to people. The ego, in all it’s glorious defences, is laid bare and explored – not as something we need to get rid of, but something we need to understand and work with. Duncan even shares one of his own coping mechanisms or ego defences – an aspect of himself he’s dubbed Harry the Hothead. He shares how Harry is triggered by one of his limiting core beliefs around self-worth – and how he’s come to recognise Harry and work with him. It’s not that that aspect of Self has completely disappeared, but Duncan realises it is not who he actually is. This clear elucidation of difficult psychological processes lifts Modern Yoga far above many other yoga books I’ve read. It delineates a clear path of transformation from living a life where one is completely identified with one’s thoughts, to being able to witness those thoughts and consciously choose how to respond to them. And this is all in Chapter One. Chapter Two goes on to look at meditation – placing the focus on the psyche and meditation well before the postures even come into play. It’s a brilliant technique meaning that those who tend to read a book from beginning to end will be steeped in the psychological aspects of yoga before they find out about alignment. It also makes the importance of these deeper aspects of yoga clear. After a chapter on Nutrition, we dive further into yoga with a chapter on Traditional Teachings. In Traditional Teachings Duncan covers everything from non-dual reality to the content of the ancient scriptures and the four basic styles of yoga. There’s surprising depth in this – I never knew that Bhakti Yoga (one of the four paths) has nine limbs (as compared to Hatha Yoga’s eight limbs). Duncan explains the four functions of the mind, plus looks at karma, vrittis (fluctuations of the mind), samskaras (habits of action) and vasanas (tendencies/habits). This builds or further elucidates his earlier chapter on belief systems and how these arise. I adore explorations of these aspects of yoga and appreciated Duncan’s clarity and also brevity. He was able to cover a great deal of ground in only a handful of pages. I can see that I will refer back to this book for this chapter if nothing else – it’s a great overview of the complexity of yoga philosophy. Finally, we get to the Physical Practice. There is so much information packed into these pages – photos, illustrations, posture break-downs, skeletal differences, posture variations – and it is beautifully laid out, a delight to read and easy to understand. Duncan takes several pages to explain Tadasana, which he explains is alive in some way shape or form in every other posture. After Tadasana, there are eighteen core poses given a double-page spread each. There’s tips on how to make the posture easier. And there’s a list of things to avoid – essential for beginners who won’t always be able to feel when something is not working in the posture. I also really appreciated how every Pose looks at it’s Purpose and Pathway to the Pose. This helps lay the groundwork for approaching the posture and make sure people enter the pose in the right way (or one of the ‘right’ ways). Core Poses is followed by simply Poses, which covers a wide variety of postures including difficult arm balances and inversions, and more advanced postures like full splits. After detailed information on all the poses, Duncan talks about Yin Style – The Balancing Practice. He describes the value and importance of Yin and a series of postures are laid out and demonstrated. I’ve started doing more yin-style practice and it’s great to have a visual reference with such detail. Finally, the last section of the book contains Sequences. I was excited about this – as a yoga teacher, I’m always looking for new material to use in my own practice, and then in classes. Of all the book, this has the least words and the least details. In fact, there’s no explanation of any of the sequences – just a photo strip of each posture with the name underneath. The sequences are also run into each other, with just a colour-code change to make it easy for the eye to see where one sequence ends and the next begins. Given the amount of detailed information through out the rest of the book, I would have liked to know more about the sequences presented – there’s 25 in total. What’s the purpose of this sequence, how does it affect the body and mind? The first few sequences are basic Sun Salutations, and then we move on to other sequences – which usually involve at least one posture I would call intermediate or advanced. The format of the sequence layout doesn’t allow for variations of these more difficult postures to be shown. This means that your average beginning home yoga practice student would find it difficult to practice the sequences as shown, and likely wouldn’t know enough to modify or change the sequence. This felt like the first let-down in the book – so far it had been great for a home yoga practitioner, or someone going to classes who wants to also start practicing at home. However, I’m sure that these sequences are the same as those taught in Power Living classes, so students of Power Living would have no problem following along at home. Sometimes I had questions about the nature of the sequencing too – like throwing a straddle headstand in the middle of a sequence with Warriors, reverse triangles, intense side bends and forward bends. And going straight from a handstand to the splits. No transition is shown, and it would be the rare student who is able to seamlessly and with control move from Handstand to Splits. It makes me think that there is some assumed knowledge here – the sequences are aimed at those already familiar with the Power Living style of yoga teaching. There are a few other transitions and sequence choices which makes me go Hmmm… I have done one or two Power Living classes, and had the same experience during class too. The sequencing pulled me up. Sometimes I didn’t feel like it was safe, and sometimes I didn’t feel like it was intelligent. I’m not sure if this is my own particular bias, or whether I’m picking up on something else. At some stage, I’m going to have to pin Duncan down and ask him about the sequencing – stay tuned for that conversation. Overall, I was impressed with almost everything about Modern Yoga. The book is beautiful, the art direction out-standing, the photography exquisite and the content detailed, accessible and nuanced. The binding also seems robust – both glued and sewn. That’s an important detail for a book that is designed as a reference book and could see daily use for someone serious about using it for a home yoga practice. I’m pleased I can add this to my yoga library, and I know it’s going to get a lot of use. 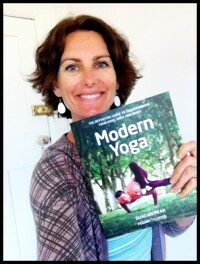 You can order your copy of Modern Yoga direct from Power Living.